The principle returning cast of The Walking Dead for Season 5. Photo by AMC. AMC’s The Walking Dead prepares for Season 5 and officially gets its own spinoff show. If you ever loved zombies and everything that has to do with survival in a harsh, post-apocalyptic setting, then there’s probably a good chance that you’re among the many fans and geeks out there that follow AMC’s adaptation of Robert Kirkman’s ongoing opus to the zombie outbreak scenario that is “The Walking Dead“, which has thrived and turned into a mega-blockbuster franchise that infects all forms of media and popculture as we know it. As it is, the network is getting ready to unleash the fifth season of this bloody and gory TV Series, picking up the pieces and resuming things where they left off: with central character Rick Grimes and his group of survivors trying to find a way out of their latest predicament and escaping from their captors who occupy the so-called safe haven known as “Terminus“. Still, there’s more than a month to go until Season 5 premieres in October 12. To satiate the hungers and needs of fans, AMC has recently released a new batch of production photos from the new season as seen in the show’s official Facebook page, as well as making an announcement that’s sure to excite fans desperately wanting more Walking Dead content – The network has given the greenlight to begin production on a spinoff “companion series”, which will begin production in late 2014. 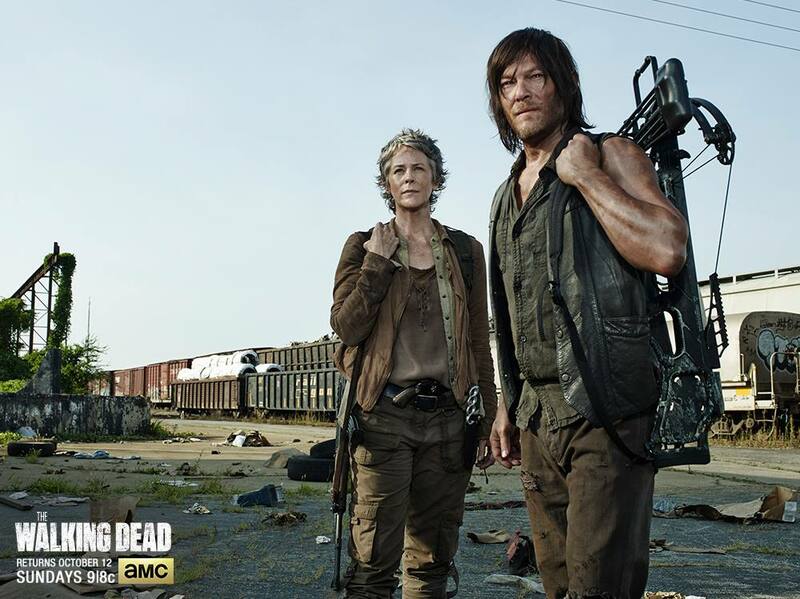 Daryl Dixon (Norman Reedus) and Carol Peletier (Melissa McBride) look onward at the distance in this screenshot from Season 5. Photo by AMC. While it’s safe to say that we’ll be seeing all the remaining surviving characters return for Season 5, not all of them will be making out of it alive if reports of how the showrunners and actors describe the new season are to be believed. Rick, Daryl, Michonne, and the others have survived worse and tougher situations in the past, but their situation in Terminus is a new threat that they’re literally caught right in the middle of. If the first teaser trailer for Season 5 released in this year’s San Diego Comic-Con was any clear indication of what to expect, the group’s going to end up making sacrifices and difficult decisions in order to stay alive. The Walking Dead Season 5 Comic-Con TrailerAfter losing their sanctuary and home in The Prison thanks to The Governor last season and finding out that there are plenty more dangerous threats besides the walkers, it will be a long hard road for Rick’s group to recover. Terminus isn’t exactly helping matters either, and their mysterious demeanor gives plenty of fans speculation as to what their “true nature” as a community really is. Without giving out too much spoilers, those who have read the comic book series know that aside from the aforementioned Governor, plenty more disturbing threats lie with the living, who have proven to be more dangerous than the dead themselves. Just who these enemies are would be telling, but the TV Series has proven to go on its on path, and not everything from the books has been adapted 100 % into television. There will be nods, twists, and turns for sure, and just about anything can happen in the world of The Walking Dead when you least expect it. 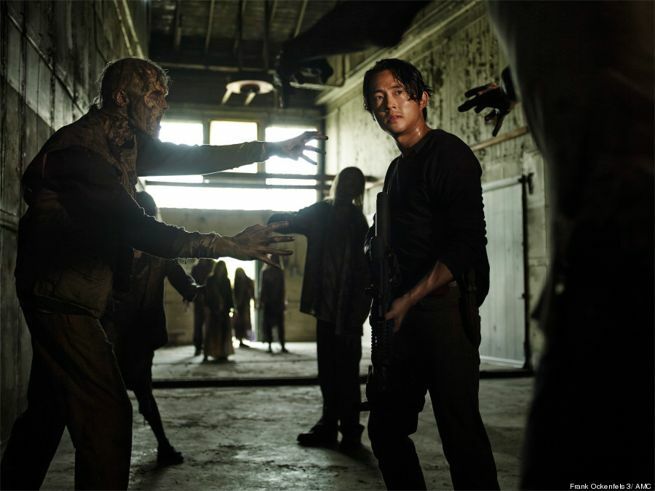 Glenn Rhee (Steven Yeun) prepares to face off against a group of walkers in Season 5. Photo by AMC. It’s also hard to tell who’ll bite the dust next as well, but fans again comparing the comics to the TV Series have an inkling of who it’s going to be. The Comic Con trailer showed bits and pieces of torture and brutality the main characters will experience during their captivity in Terminus, so what’s left to find out is whether they go that way, or as human flesh food for the walkers somewhere down the road. Only time will tell for sure, as the group eventually makes the perilous journey from Terminus to Washington, following the mission set by Sgt. Abraham Ford and Dr. Eugene Porter that there’s a cure to the zombie epidemic in the capital. Walkers will always be the prevailing and constant threat for the world of The Walking Dead. Photo by AMC. As for where things will go with the newly announced “Companion Series“, that’s a sandbox AMC has free reign to play around with and set at any given period in the world of The Walking Dead. According to Entertainment Weekly, Sons of Anarchy’s own Dave Erickson has been named as the showrunner for the spinoff, which will begin production sometime in late 2014. As if that weren’t enough, creator Robert Kirkman and TWD show producers Gale Ann Hurd and Dave Alpert are working on the project as well, with Kirkman and Erickson turning over the script that gave the pilot the greenlight to go. 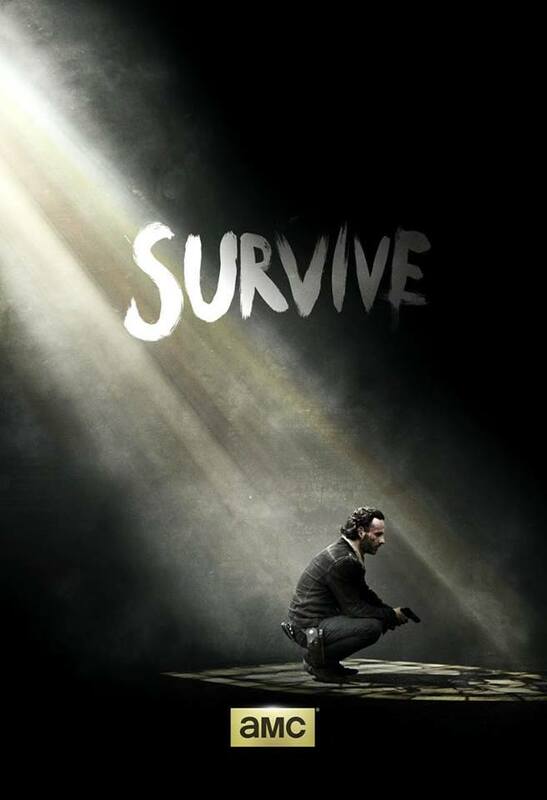 “Survive” teaser poster of Season 5 released after the end of Season 4, featuring Rick Grimes (Andrew Lincoln) kneeling in a dark room with a ray of light shining down on him. Photo by AMC. In a nutshell, we will see another scenario that will play out in The Walking Dead companion series. It may be in another country or another place away from Georgia where the main series takes place, or even occur in a different time period that’s before or after Rick Grimes’ story. Whatever happens, there’s sure to be a lot of fans tuned in once everything goes into production and we get the first glimpses of an image or teaser trailer. Stay tuned for more details on the spinoff as they become available. 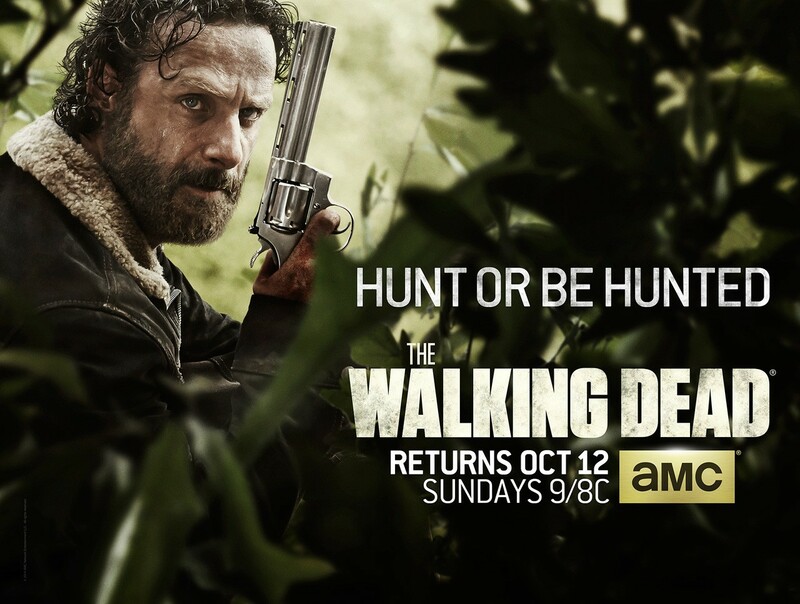 The Walking Dead returns with its fifth season on AMC starting Sunday, October 12.